The Friends History Action Group recently placed a notice in the Desperately Seeking column of the Herald Sun and have since been overwhelmed with the response. Train buffs have appeared all over the state with photographs and stories of the line while it was in operation. Some of them we’ve collected here. 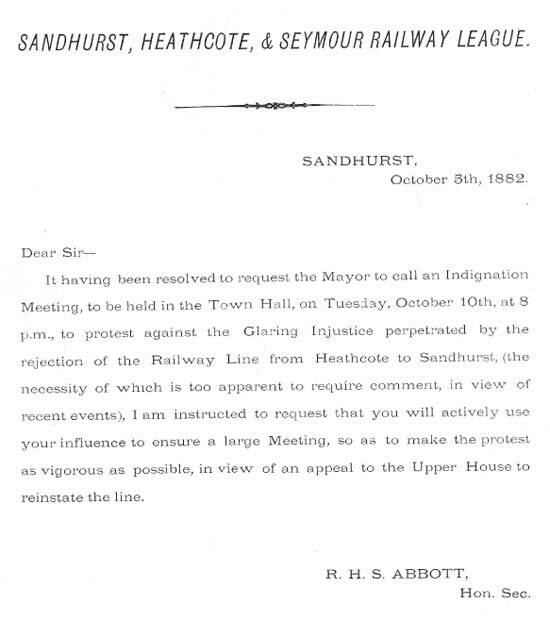 One of the gems is a letter dated 5 October 1882 from the Sandhurst, Heathcote & Seymour Railway League demanding the mayor call a public “indignation meeting” to “protest the rejection of the railway line from Heathcote to Sandhurst (the necessity of which is too apparent to require comment, in view of recent events. )” We’re not sure what those recent events were, but sometimes the Friends empathise with the frustration of the Railway League!